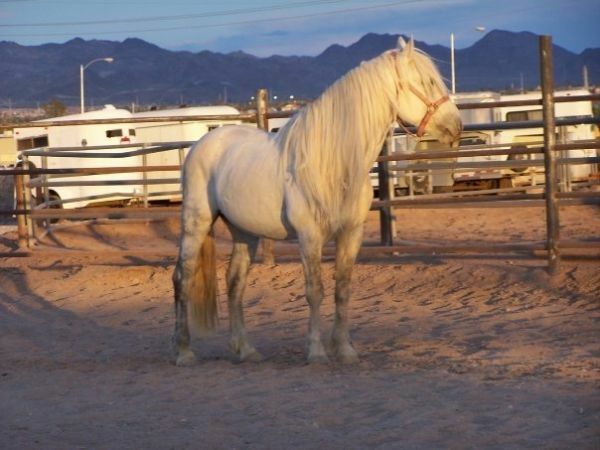 Tarot: Tarot is a 2000, grey Comstock mustang stallion. 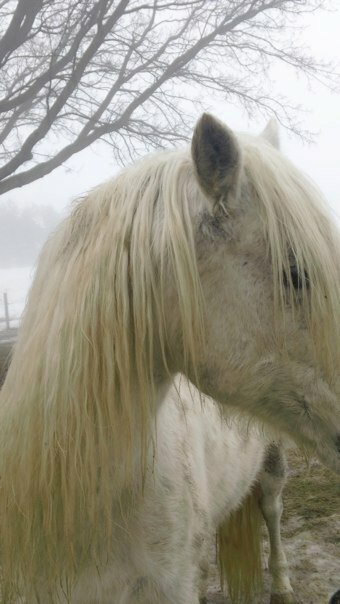 I bought Tarot before I even had a place to keep him, knowing how difficult it is to find a boarding barn that will keep a stallion, much less a mustang stallion who is fearful of humans. I was scrolling down the internet looking at pictures of horses when I saw the picture to the left. His price was cheap in comparison to his beauty so I was curious. People usually set a high price for beautiful animals. 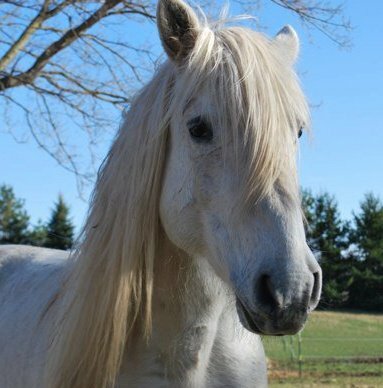 When I called his owner, Trisha, she was open and honest: Tarot was an unusually fearful horse who would require a very patient owner and quiet, gentle handling. Despite having trained many mustangs herself, she could not teach him to allow his back feet to be handled without kicking or to accept a saddle without fear. She had sat on him three times. The first time he had bolted and she had fallen off, the second and third he just stood stock still, frozen in between just a few tense steps. In Las Vegas where she lived, there were a lot of cowboys just waiting to try their hands with difficult horses. She was scared if one of them got their hands on Tarot he would be ruined permanently. Tarot’s introduction to humans was a warning about human carelessness. 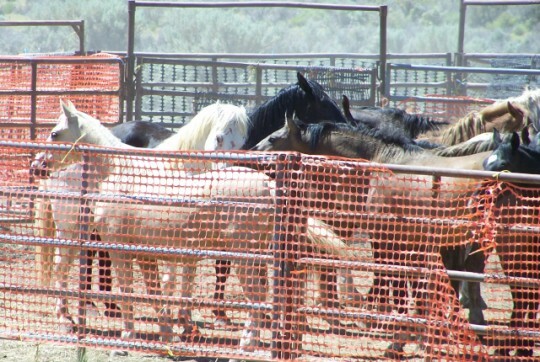 The Comstock mustangs aren’t under the jurisdiction of the BLM so all the individual pieces of gathering horses: the round up, the transport, the long-term holding are often handled by different private companies. I don’t know the finer details of the situation, but once Tarot was rounded up with his herd, the company that was supposed to transport the horses from the temporary pen to the long-term holding either didn’t show up or had never been hired. Tarot and the rest of the gathered horses spent two weeks in a holding pen in the desert without food or water. Some of the horses died. Tarot survived but obviously he was stressed and frightened. He went to a horse rescue for the next three years where he received good care but minimal handling. He was adopted out three or four times, but each time he was returned. He had a total of six homes before at eleven years old he was listed for sale again. I felt a deep, immediate connection to him. I wanted to know what it would mean to build a common language with him. I offered to buy him as long as I could get thirty days to find a place for him to stay. When I met Tarot he had a three foot aura around his body in every direction that he preferred no one breach. There was an energy field that surrounded him. If you entered it he walked away. He was the most reserved, careful, watchful horse that I have ever met. I think most people picture a spooky, bolting kinetic horse when they imagine a fearful mustang but Tarot never wasted any energy. He was the definition of self-preservation. You do not squander energy when it might be needed later for survival. He was so self-contained that he felt like a dignitary and I felt both awkward in my human-ness and guilty for what my species had done to him. But guilt doesn’t build new relationships so I put it away and began the work of teaching him to trust, inch by inch. We started at the beginning. Can I share space with you? Can you eat from my hand? Can you touch this target with your nose for a click and treat? Can you follow the target, follow me? All of our training sessions were done out in his pasture with him loose, so he could choose whether or not to engage in the lesson. There were no halters, no lead ropes, no whips and no round pens. This was not a horse you could coerce. Despite the fact he always chose to engage in the game and his learning progressed, he still felt like he was just tolerating me for the food. I felt guilty that he was captive at all and wanted to offer him a life that felt good to him and larger than the size it had shrunk to with his fear. I gave up training for awhile and just took him out grazing every morning. I didn’t pressure him to offer any behavior, I just walked along with him and watched him eat. There were weeks and months I felt like he would never open up and that I was just a necessary evil in his life. I talked with him while we walked about horses and humans, what it means to be wild, what it means to be tame and how strange the world is. I know horses don’t understand a spoken language but it cleared my body and my heart. My grey horse used to be a star. On his last day in the heavens he was offered three roads and he chose a narrow path made of crushed indigo stone. The path of the horse. He picked his way carefully down out of the sky, his mane spilling silver as he walked. Everyone who meets him knows he is ancient. Mere strangers understand he can move between worlds. He is a messenger. 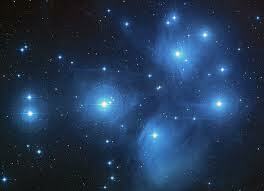 But stars speak an old language that has so far gone undeciphered. It is up to me to learn. So I am learning a new language. Learning to translate our rough syllables to something graceful for an animal who sometimes seems entirely made of light. Light shifts, it changes. You can’t capture it and you can’t hold it down. This summer something shook loose in Tarot and he began to express emotions other than caution and fear. He started to whinny to me when I came outside, chortling through his nostrils like he does for the mares. He trotted up to the fence for the first time when I came out to train and now does so every time, waiting at the fence line while I train my other horses. He would even come trotting up while loose on the property from over fifty feet away, leaving his freedom voluntarily to choose the games I offer over long grass and wandering. He feels looser and happier. Now, he is able to participate in some of his care with the vet through the use of the clicker, he is relaxed in the barn and able to work down in the outdoor arena without worry. He trusts me, not fully, but he trusts me. We have some good agreements in place. He’s thirteen now and if I’m lucky he’ll live to be thirty. He teaches me all the lessons good trainers must learn: how to be patient, how to be flexible, how to be consistent, how to be structured, self-aware and fully present in every moment. I named him Tarot because they are the cards that reveal you to yourself. He teaches me and I teach him. Together, we are mapping out a new world. I read your post and felt a connection to your story, I got an 11 year old “crazy” Appy stallion who was the same, my friend rescued him but could not deal with him. I saw his eyes and felt that connection. Been raised around horses for all my life, 49 years and never felt that way about a horse. I offered to work with him, it was a slow process and my friend ended up giving him to me. He is Black Hawk, the best horse I have had the good fortune to work with, he taught me so much more than I taught him. Fast forward to 5 years later, my 12 year old rides him and he lets perfect strangers handle him. 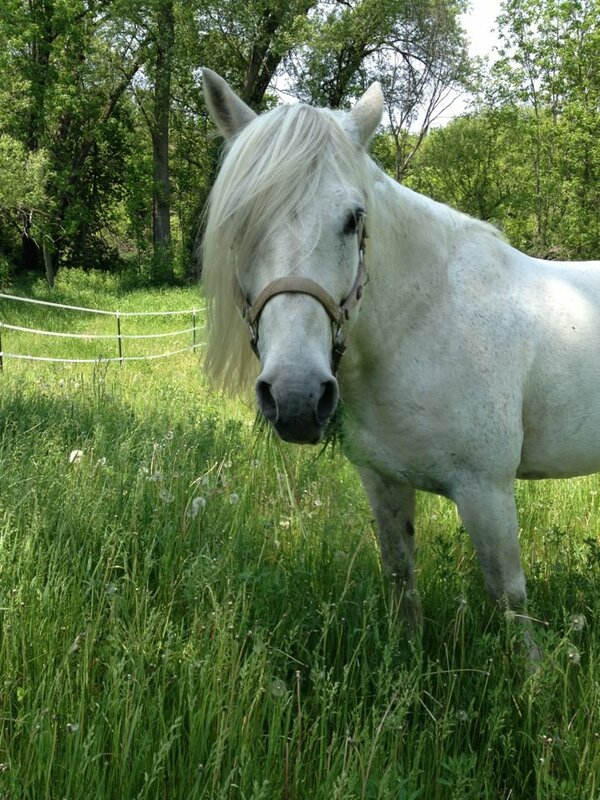 How fantastic you are making this journey with Tarot….thank you for saving and caring for Tarot!